How Much of the Dividend do You Earn? Your effectiveness in relationships depends on how much people see you as living by your word. Where they see it strongly, people trust you more, listen more closely to you, and allow you to influence them. This form of credibility is necessary to lead, to sell, and to address conflicts. It shows up on the bottom line as the integrity dividend -- and I can prove it. But managing credibility is not a trivial challenge; it is hard work. Most of us undermine the power of our words in a thousand small and large ways. This website, the book, the organization, and I are dedicated to helping managers and companies build credibility so they can earn more of the integrity dividend. 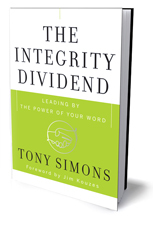 I wish my mother was still alive to read 'The Integrity Dividend' because Tony Simons demonstrates that everything I learned at my mother's knee is good business. It's about time that integrity in business has moved into the category of critical success factors. This book is an important contribution to this expanding conversation. Tony Simons richly illustrates a powerful benchmark of leadership credibility. The Integrity Dividend vividly shows how an impeccable commitment to your word can affect business relationships, cultures, and performance. Then it shows how to get there. Leadership integrity.....often talked about, never objectively valued. Now Tony Simons is demonstrating its bottom-line impact. Every aspiring leader should own a copy......and some existing ones too. Loaded with real world practical examples, The Integrity Dividend, reminds us all of the value of trust and how to achieve it in an organizational setting. 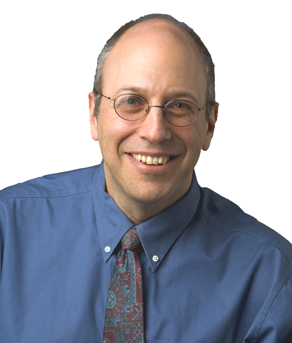 Dr. Simons' ground-breaking work demonstrates the cost of not keeping our word to staff and better yet, proves the economic benefits of integrity. Every executive I have introduced to his work has been impressed. You will be too. A culture of promise-keeping is a competitive advantage for any great company. If you want to lead such a company, read this book and take its message to heart. THE most important management lesson you'll ever study. The Integrity Dividend makes clear beyond any doubt that the power of your word is the ultimate source of your success in the world. Finally! A book that connects Behavioral Integrity and Results. Tony Simons book should be mandatory reading for anyone who seeks to lead others! Lloyd Hill, Former Chairman and CEO, Applebee's International Inc. The Integrity Dividend is an exceptional work on a fundamental and oft-misunderstood subject in today's global business environment. The Integrity Dividend: Leading by the power of your word (Jossey Bass 2008) is available online, in stores or through this website. It is a how-to book, based on my research and on the stories and insights of executives and coaches.